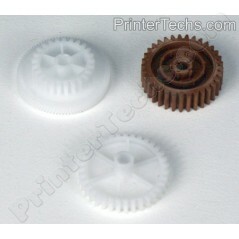 Set of 3 plastic gears to repair grinding noises from the fuser drive assembly on HP LaserJet P4014, P4015, P4515, or M4555. These plastic gears are a common failure part. Upgrade is available: We now offer a METAL gear kit with much longer life potential, click here for more info. HP part numbers: RU6-0170, RU6-0171, RU6-0172 . NOTE: This is considered a major repair. We do have installation instructions for the P4014, P4015, or P4015 in our Tech Support section. If you hear grinding noises from the rear of your HP LaserJet P4014, P4015, P4515, or M4555 series printer, you probably need to replace these 3 gears in the fuser drive assembly. Upgrade is available: We now offer a METAL gear kit with much longer life potential, click here for more info. NOTE: This is considered a major repair. Check out our installation instructions here for the P4014 P4015 P4515 model here: Replacing the Fuser Drive Gears on HP LaserJet P4015 series printers (For the M4555 fuser drive assembly, this installation is much more involved -- contact us for instructions availability.) HP part numbers: RU6-0170, RU6-0171, RU6-0172 Call us with any questions at 866-352-7108.